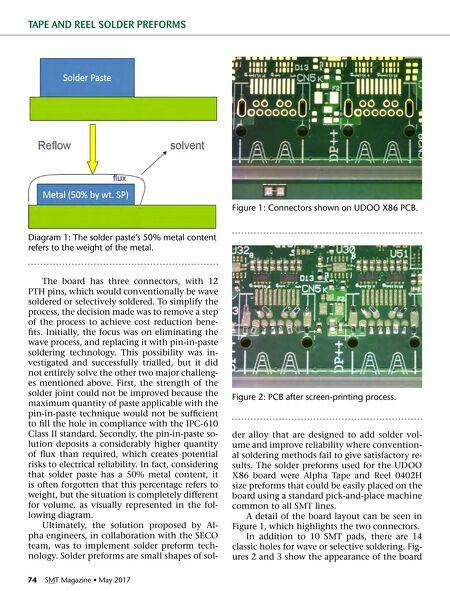 74 SMT Magazine • May 2017 TAPE AND REEL SOLDER PREFORMS The board has three connectors, with 12 PTH pins, which would conventionally be wave soldered or selectively soldered. To simplify the process, the decision made was to remove a step of the process to achieve cost reduction bene- fits. 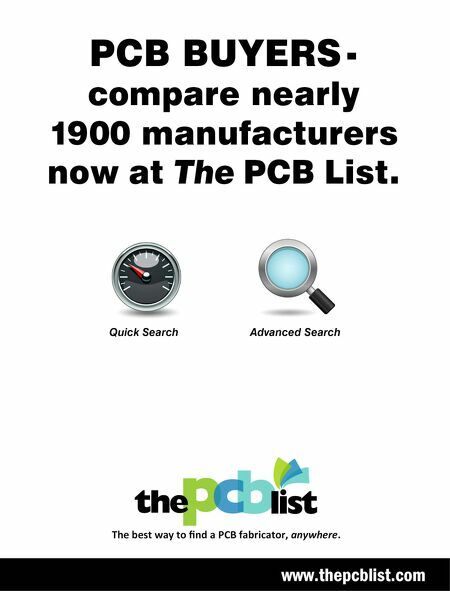 Initially, the focus was on eliminating the wave process, and replacing it with pin-in-paste soldering technology. This possibility was in- vestigated and successfully trialled, but it did not entirely solve the other two major challeng- es mentioned above. First, the strength of the solder joint could not be improved because the maximum quantity of paste applicable with the pin-in-paste technique would not be sufficient to fill the hole in compliance with the IPC-610 Class II standard. Secondly, the pin-in-paste so- lution deposits a considerably higher quantity of flux than required, which creates potential risks to electrical reliability. In fact, considering that solder paste has a 50% metal content, it is often forgotten that this percentage refers to weight, but the situation is completely different for volume, as visually represented in the fol- lowing diagram. Ultimately, the solution proposed by Al- pha engineers, in collaboration with the SECO team, was to implement solder preform tech- nology. Solder preforms are small shapes of sol- der alloy that are designed to add solder vol- ume and improve reliability where convention- al soldering methods fail to give satisfactory re- sults. The solder preforms used for the UDOO X86 board were Alpha Tape and Reel 0402H size preforms that could be easily placed on the board using a standard pick-and-place machine common to all SMT lines. A detail of the board layout can be seen in Figure 1, which highlights the two connectors. In addition to 10 SMT pads, there are 14 classic holes for wave or selective soldering. Fig- ures 2 and 3 show the appearance of the board Diagram 1: The solder paste's 50% metal content refers to the weight of the metal. Figure 1: Connectors shown on UDOO X86 PCB. Figure 2: PCB after screen-printing process.